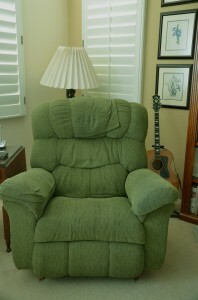 I don’t have a “Man Cave” per se, but I do have a big, comfy Daddy chair. It’s green, just so you know. 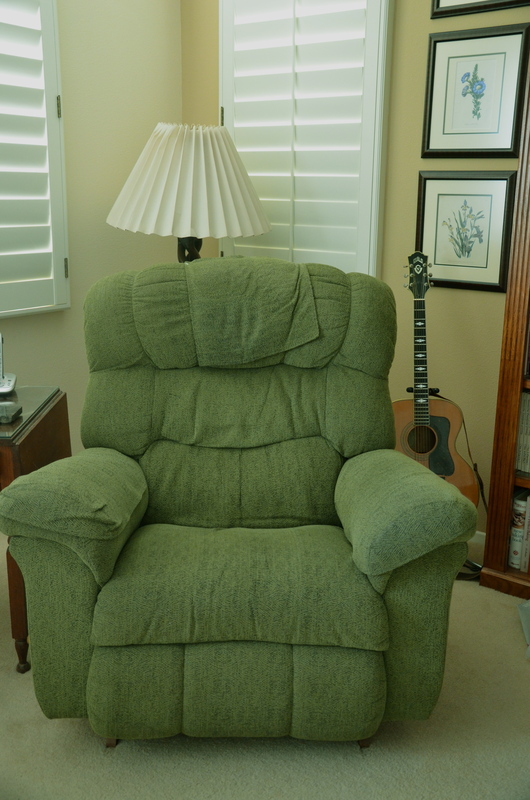 I didn’t go looking for a big, green chair; I just went looking for a place to relax. As it happened, the only chair in the store that felt right on my bones was very big, and very green. A chair like this doesn’t fit just anywhere in the house, a fact which my bride was careful to point out. It’s a recliner, of course, and so requires a generous amount of space. My chair is strategically positioned to provide me with a commanding view of my surroundings, while preventing any sneak attacks from the rear. Each year, I suffer it to be moved to its December home in a different corner, so as to make room for the Christmas tree. I think that’s pretty big of me. You may think it strange that I would devote an entire post to a piece of furniture. Perhaps. And yet, this piece of furniture has born witness to much of the life of our home. I have read many a good book to my children from that chair—not to mention introducing them to a number of classic movies. I have opened nearly every Christmas present for the past seven years from that chair. Family Worship? If we’re not on the bed, I’m in my chair. When I ponder the secrets of the universe, with my eyes closed and my breathing deep and regular, it happens there. We sometimes call it the cuddle chair, and with good reason. I have held my bride, my son, and my daughter there, singly or in groups. I have nursed an injured puppy there, as well as two dying guinea pigs. When our 70-lb golden retriever was scared by a thunder storm, she made a beeline for the cuddle chair. This is where I start my day, reading God’s Word. I gather strength here, before heading off to face the world. This is where I collapse at the end of the day, soaking in the peace of home. This is where I stop, and breathe, and praise God for all He has given this poor wretch of a man. Yeah, I know—it’s just a chair. But it’s also a mini-sanctuary, my quiet place. Part of living a life worthy of the calling is taking time to recognize all the ways God is working in our lives. It sounds trite to say, “Count your blessings.” So what? I’ll be trite. I want to honor God with my actions; I should also honor Him with my stillness. So I take to my chair and I think of all the ways I have been blessed, and in this way I am living a life worthy of the calling I have received. I have lived a good portion of my life in that chair. I have lived a portion of my good life in that chair.